It is structured to aid children’s physical development, coordination, spatial awareness, sensory development, creativity and self-expression, working individually, with a partner, or as a group. Melody Movement also introduces chi ldren to other fundamental curriculum learning skills such as counting, colour and shape recognition, vocabulary and language skills. The strength of the system is that learning is achieved through imaginative movement which is enjoyable and fun. 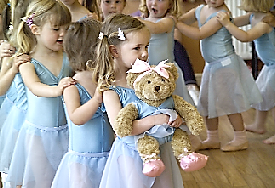 Bear for 2 to 4 years and First Ballet from 3 and a half years. Classes are held at various times and locations so please check the schedule for your nearest class. Please browse the following website for more information on the Melody Movement syllabus: www.melodymovement.com.